Today's Problem: How do you paint an icon. I'm not talking about the religious type of icon painted on a wooden panel , I mean an icon of a place. 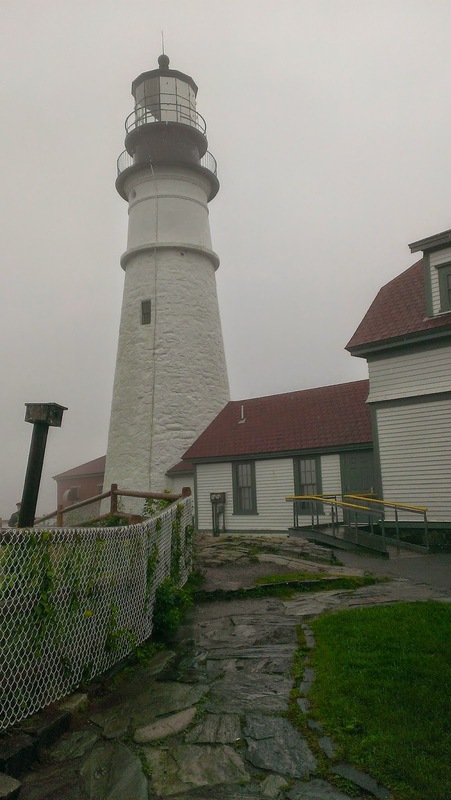 The Portland Head Light located in Cape Elizabeth, Maine is an iconic image if ever there was one. It is probably the most photographed lighthouse in Maine. Nearly everyone has seen a photograph, calendar, postcard or print of it. So why am I going to paint it? 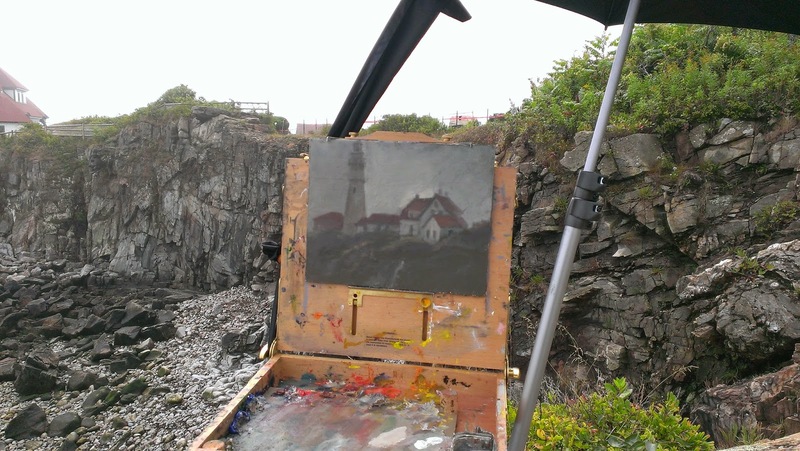 I have been there many times and painted the surrounding coast line but only a few times have I tried painting the lighthouse. Once, it was foggy and raining and I stood 6 inches from the edge of a cliff to do it. Every artist I know likes to eat. Some, more than others, and some think drink is more important, but the end goal is the same. Eat to live and live to paint....... but we must sell something to do either. Since gallery owners who represent artist's have the same interest in eating, we both make compromises in order to attract collectors. Sometimes that means painting subjects that everyone has painted before. This is not a new problem that the artist faces but it always brings up the same questions for us. Who do I paint for, myself or a potential collector? If you paint still lifes, ask yourself how many apples or sunflowers have been painted before and by how many artists? Yet, people love and continue to buy paintings of apples and sunflowers... and this has been going on for centuries. 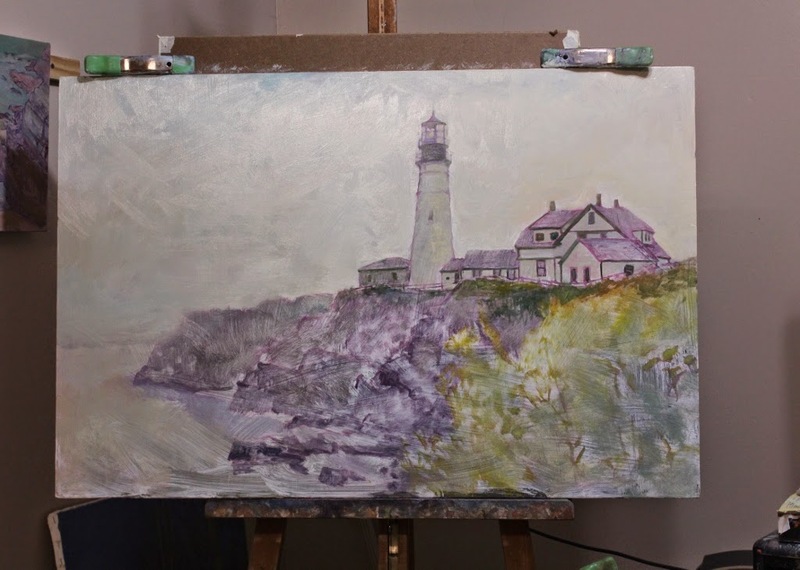 So I have no problem at all painting a lighthouse that is an iconic image... well, I have lots of problems painting it just not a problem selecting it as a subject.